Purchase in bulk and save! Play groups, Nurseries, Day care centers, or anyone that would like to purchase in bulk, can save lots of money by shopping in our Bulk Baby Sheets section! SheetWorld manufactures high quality sheets and bedding for infants, children and adults. We are proud to supply our American-made, 100% cotton products to private homes as well as nurseries, daycares and playgroups that need wholesale prices on bulk crib sheets and more. We make our sheets and linens using fine quality cotton jersey, flannel and percale, meaning you'll be able to wash and use your SheetWorld sheets again and again, with no loss of quality or softness! Check out our wide selection of wholesale-priced crib sheets, bassinet sheets, pack n play sheets and more, and let us guarantee your satisfaction. SheetWorld has a huge selection of crib sheets at wholesale pricing in a range of colors and sizes. 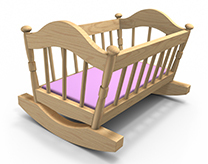 We design and manufacture both premade and custom made crib sheets for round cribs, oval cribs (Stokke Sleepi and Stokke Mini) and traditionally-sized cribs. We only use 100% cotton jersey knit fabric to ensure softness and durability. Choose from plain white, as well as a variety of prints and colors, to make your sheets the perfect accent to your existing décor. Don't see what you need? No problem - our custom sheets department will be happy to create and manufacture the perfect design for you. 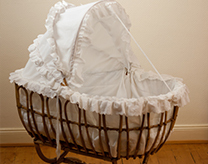 Have you tried finding bassinet or basket sheets in bulk? At SheetWorld, we make it easy to buy wholesale bassinet sheets in a wide range of colors and styles. We know that bassinets and baskets are the ideal solution when you need a comfortable area for your baby to sleep but taking the crib along isn't possible - and when you need bulk bassinet sheets, SheetWorld is your go to source. Like our crib sheets, we are happy to send you all the premade designs you need or we can customize them for your existing furnishings. Whichever you choose, our bassinet and basket sheets are always made with the softest 100% cotton! Graco's Pack N Play is the solution to so many caregiver dilemmas - if only they came with multiple sheets. With SheetWorld, you can order bulk Pack N Play sheets and make running your daycare or nursery so much easier! We carry traditional, quilted and square Pack N Play sheet sizes. Of course, we can also create custom-sized sheets for other Pack N Play brands. You can wash, dry and reuse our Pack N Play sheets over and over again, with no breakdown in quality. And because they're made from 100% cotton, you'll never have to worry about damaging your baby's tender skin. SheetWorld also carries mini crib sheets, including sheets for the BabyBjorn Travel Crib Light. We make it easy to save money when you place a wholesale mini crib sheets order, which can be difficult to find in bulk sizing. And like all of our products, our mini crib sheets are made right here in America of 100% cotton. Choose a premade style or create an entirely new design of your own choosing, which we will customize for your precise needs. At SheetWorld, it's up to you! In addition to our huge selection of sheets for infants and toddlers, we also design and manufacture high quality cotton sheets for adult beds, including pillowcases. We can even create a gift set of custom made sheets made to your exact specifications - imagine how thrilled a loved one will be when she opens a gift set of custom made sheets to match her baby's nursery at her baby shower! When you buy sheets at SheetWorld, you can do that and more. From bedtime to playtime to taking a trip to the zoo, you can keep your baby comfortable with soft, high quality sheets from SheetWorld. We make it easy for families and professional caregivers to maintain a steady supply of high quality, beautifully made sheets in custom sizes. We also design and manufacture premade and custom-crafted changing table pad covers, sheet protectors, stroller liners and nets, baby pillows, body pillows, wash cloths, crib skirts for infant beds of all sizes, bumpers, cradle sets - you get the idea. At SheetWorld, we can design and create the perfect set of sheets for you and your littlest loved ones! At SheetWorld, we know you could choose to shop anywhere and we are delighted you chose us! We pride ourselves on providing outstanding customer service - and that is just one reason why we have been in business for over 25 years. In addition to providing free shipping on orders over $75, we fill orders promptly. And if you're not fully satisfied with your order, you can return your item for a full refund within 30 days! Simply request a return authorization number from us, and send it back in the original packaging. Custom made orders are not returnable once completed. SheetWorld is proud to be the place where the world shops for sheets. Over the past 25 years, we have supplied specialty retailers and furniture stores with beautifully-made bed linens in hard-to-find sizes. We use only the finest, softest fabrics and are delighted that our online customers appreciate our attention to detail. We update our inventory frequently to highlight our newest creations and fabrics, which include soothing pastels, rich jewel tones, darling prints and sweet accents. Check back with us regularly to see the newest products and special offers from SheetWorld, as we update our stock regularly! SheetWorld designs and manufacturers every product sold on our website right here in America. We don't resell other labels' designs - all of our products are made by SheetWorld. From jersey knit crib sheets to percale bedding to the softest flannel, when you order sheets through SheetWorld, you know you and your children will sleep comfortably. Explore our crib sheets sets, body pillows, stroller accessories and more, and find out why we are your go-to source for high quality, high value sheets!